Roughly 120,000 Akita Prefecture residents were ordered or advised to evacuate on Sunday as the risk of flooding and landslides rose following torrential rain in Tohoku, authorities said. 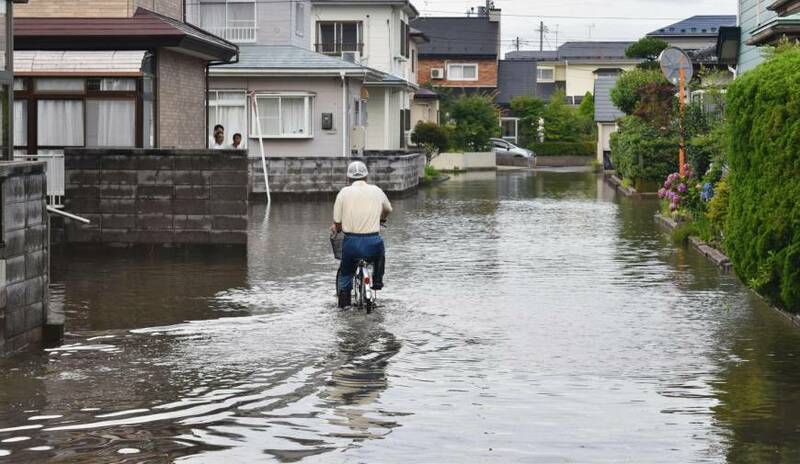 On Sunday afternoon, the Meteorological Agency warned of more flooding as an active rain front that brought record rainfall to parts of Akita decided to park itself over the Tohoku region. The cities of Yurihonjo, Daisen and Senboku, as well as the town of Misato, collectively ordered 24,000 residents to evacuate after it was reported that houses had been flooded and landslides had struck various parts of Akita, local officials said. Another 96,000 people in six cities and three towns in the prefecture on the coast of the Sea of Japan were issued evacuation advisories and urged to prepare for floods and landslides, the officials said. The storm caused flooding along stretches of the Omono River, while several other rivers were deemed at risk of overflowing their banks. In Senboku, some 350 guests and employees at the Tamagawa and Shin-Tamagawa hot spring resort got stranded by flooding, as did people in other places, including the city of Yokote. 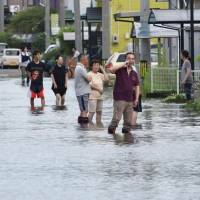 After an information meeting organized by officials of the Akita Prefectural Government and the police, it was confirmed that 95 houses in the prefecture had been flooded so far. 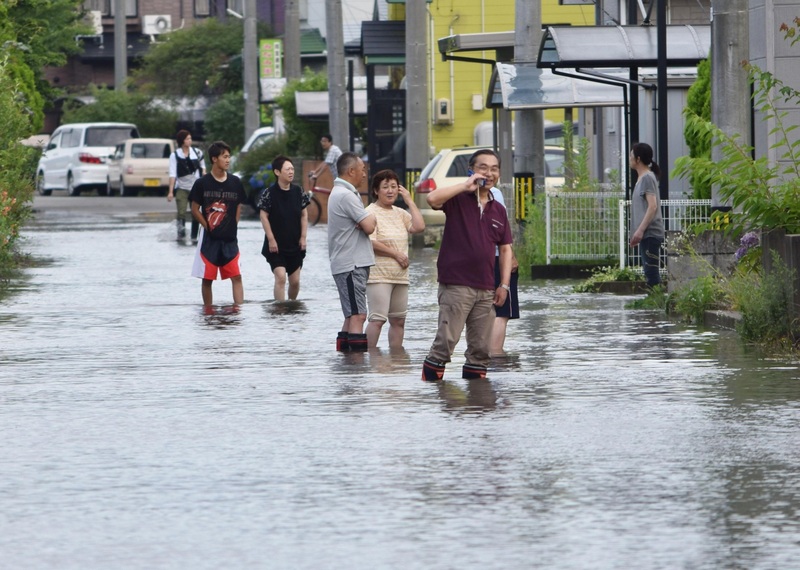 According to the Meteorological Agency, one part of the city of Akita had received a record 340 mm of rainfall during a 24-hour period that ended at 7 a.m. Sunday. 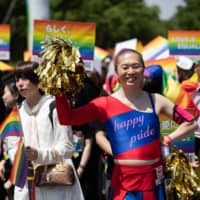 Record amounts of precipitation were also recorded in several other parts of the prefecture, with some areas breaking their monthly rainfall records for July, it said. In Daisen, an apparent landslide sent mounds of dirt, stones and other debris down onto a 20-meter stretch of Route 105. “The height of the accumulated soil reached 3 meters at one point. 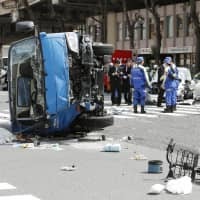 We’re looking into more detail about what happened,” a prefectural official said. The poor weather prompted East Japan Railway Co. (JR East) to cancel one bullet train between Akita and Tokyo and all runs between Akita and Morioka in adjacent Iwate Prefecture on Sunday, the railway said. In Iwate, the capital, Morioka, and three other municipalities advised some residents to evacuate or prepare for evacuation due to concerns about flooding and landslides, government officials said. 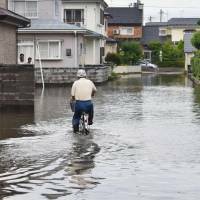 Two households in the town of Iwate were meanwhile ordered to actually evacuate.